I’ve had the pleasure of attending The MIX several times in the past and it’s always been a great event. 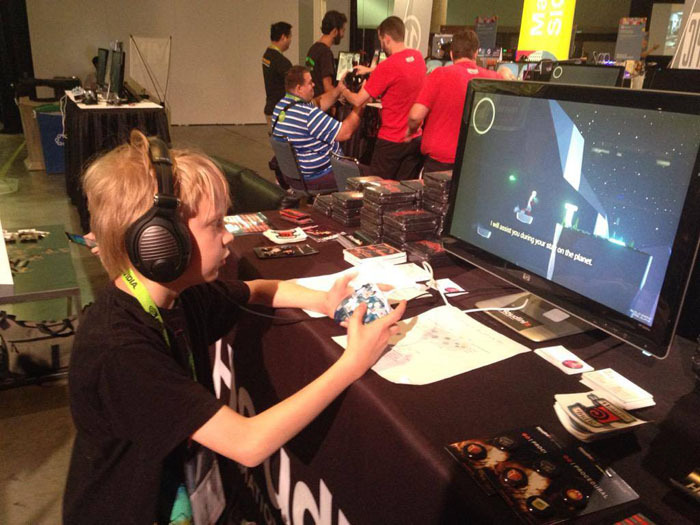 The organizers’ goal is to put indie game developers and their games in front of journalists, industry pros, gamers, and other game devs in an affordable and easy manner. 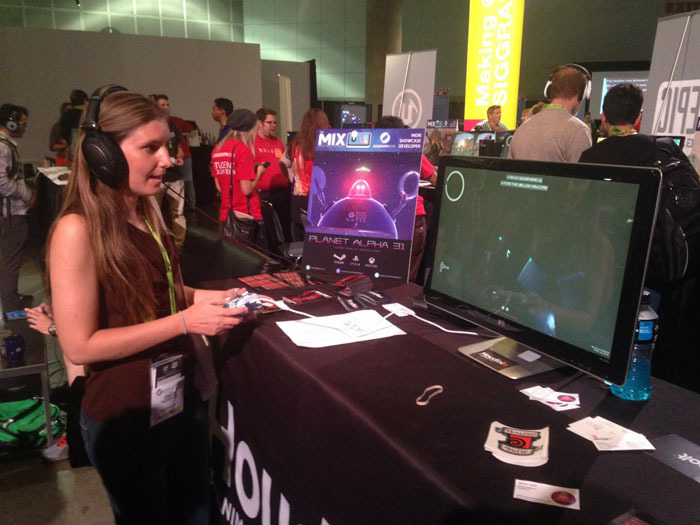 Needless to say, there’s a lot of fun games to play and a lot of awesome people to meet, so when the opportunity to participate as both a sponsor and exhibitor at The MIX at SIGGRAPH 2015 came up it was a no-brainer decision. As the Games Community Manager at Side Effects Software I get to interact with game developers and attend game industry events, which are two things I love to do. At The MIX at SIGGRAPH we wanted to show off how our 3D software, Houdini, can be a powerful tool for game development (as well as debunk the common misconception that Houdini is only used for visual effects in big budget movies. Yes, it can be used to make games too!). There are a lot of AAA game studios already using Houdini, but most indies aren’t that aware of it yet. Thankfully, we had a great made-with-Houdini example in the form of a game called Planet Alpha 31 that is being built by Danish game developer, Adrian Lazar. 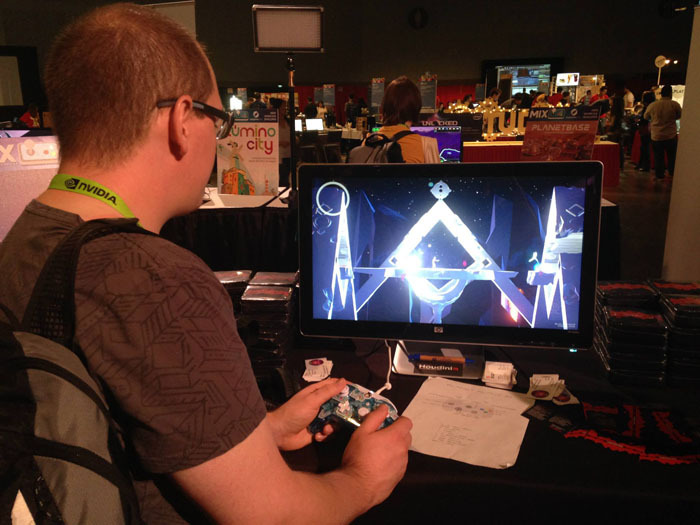 Adrian was excited to have us demo a prototype of his game and we were very happy to have a cool indie game for people to play! Planet Alpha 31 is “a story driven puzzle platformer, mixed with bits of action and exploration that takes place in a beautiful but dangerous world”. The player controls a stranded astronaut who must explore the strange environment while avoiding death due to traps (usually involving lasers), pitfalls, enemies, and a giant killer robot. There are many challenging puzzles for the player to solve that drive both the gameplay and the narrative. The visual style of the game is very interesting because it contains a mix of low poly and high poly art pieces that contrast nicely with each other. Adrian used Houdini to create almost all of the art assets, and then put those assets into Unreal Engine to build the game. Planet Alpha 31 has already been greenlit on Steam and will eventually be released on PC, PS4, and Xbox One sometime in 2016 (fingers crossed). Showing Planet Alpha 31 to hundreds of people and explaining how Houdini was used in its creation was an awesome experience. The game isn’t available to the public yet and Adrian had only shown it once before at Casual Connect Asia, so the game was completely new to everyone. All of the players seemed to enjoy the game and most of them made comments about how much they liked the visual style. We used our time at The MIX as a huge playtest session and tried to get as much constructive feedback as possible. The players helped us find more than a few bugs that we probably wouldn’t have seen ourselves, and Adrian was quick to fix them and send an updated build each night. It could be frustrating for some players when they hit a bug, but they cheered up when we assured them that they had in fact found a bug and were helping to improve the game. The MIX is a great place to playtest and get real face-to-face feedback, I’d highly recommend it to all game devs who care about enhancing their player’s experience. Overall, The MIX at SIGGRAPH 2015 was an epic event (which reminds me that Epic Games was also a sponsor and showed some really cool games built on Unreal Engine, like the VR game World War Toons. It’s a lot of fun to talk to the game developers, interact with the players, and of course, play all the games (specifically Arena Gods, I think that game was easily the crowd favorite). 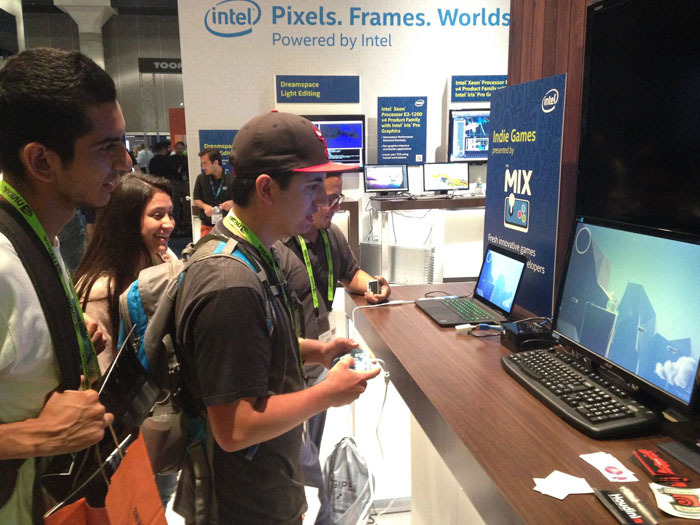 Whether you’re attending The MIX to play and learn about indie games, or you’re a dev who wants to show people your game, I guarantee you will have a good time and learn a lot. I’m already looking forward to the next time I get to go to The MIX!